The purpose of the website is to offer services and products relating to the sectors of construction, alteration , construction, decoration and architecture. Use of this website implies full acceptance of the provisions contained in this Notice as published by the Camping Ruta de la Plata at the time the user accesses the Web Site . Also, the Camping Ruta de la Plata hereby informs users of this Website that these Terms and Conditions may change without notice. Consequently, the user must carefully read this Legal Notice in each of the occasions on which they proceed to use the Website as it may be modified . Your use of the Web by third parties gives them the status of user and implies full acceptance of the User of all and each of the Conditions which are incorporated in this legal notice and acknowledges that access to the web as well as using services and content is under their sole responsibility . The User agrees to use the Website, its contents and services in accordance with the Law , this Legal Notice , good customs and public order . Similarly, the User agrees not to use the Website or the services provided through it for illegal purposes or contrary to the contents of this Legal Notice , detrimental to the interests or rights of third parties, or which in any way could damage, disable or impair the website or its services or impede normal enjoyment of the website by other users . The owner of the web business is not in a position to offer, or warranties as to the accuracy of any information contained in the web site and error or omission is wrong or might have become obsolete . This information will not be considered as constituting a contractual offer of products or services displayed on the website. Both the illustrations and the text are susceptible to variations or may not correspond exactly to the specifications of the product. The company that owns the website reserves the right to make any modifications it considers appropriate. In order to minimize the inconvenience caused by any errors are strongly advised to use these as a guide recommended. If it detects that there is incorrect or improper deals content please let through recepcion@campingrutadelaplata.com address. Also, the User expressly undertakes not to destroy , alter , disable or otherwise , damage data , programs or electronic documents and other items found on the website of www.campingrutadelaplata.com , and it undertakes no introduce programs, viruses , applets , macros , ActiveX controls or any other logical device or character sequence that cause or may cause any type of alteration to the computer systems of the web , of the owner or third parties. The User agrees not to obstruct the access of other users to access service through massive use of computing resources through which the service is provided , as well as actions that may damage, interrupt or cause errors in said systems. The company that owns the website will not be responsible for any failures that may occur in communications , including deletion , incomplete transmission or delays in sending , it does not guarantee that the network is operating at all times. Not be liable if a third party, breaking the security measures established access to messages , enter computer viruses or produce any other damage to the computer system that may impact on its users. The company that owns not control or guarantee the absence of computer viruses in the services provided by third parties through the Website that may cause alterations in your computer system (software and hardware) or electronic documents and files stored in your computer system. The company that owns the website reserves the right to refuse or withdraw access to the Web Site and / or Services at any time without prior notice to the user and / or client, for alleged commission of any offense or offenses typified by the current , or in case of observing any conduct which in his opinion are contrary to morality , public order, decency or the internal rules of the owner or employees or to disturb the smooth functioning , credible criminal code and / or web or prestige of the owner . Similarly reserves the right to temporarily suspend, without prior notice, access their websites because of the need for maintenance, repair, renovation or improvement thereof , or discontinue providing the service at any time and cease , if any , in the free provision thereof. The owner of the website will not be liable , either indirectly or in the alternative, damages of any kind arising from the use or purchase of the Content and the Services of third party anywhere. Similarly not incur any liability in the same terms as the previous point about the lack of legality, reliability , usability, reliability , accuracy, completeness or timeliness thereof. With character and in no case limiting will not be liable for damages of any kind arising from the unfair competition and illegal advertising, content or inappropriate or fraudulent services , potential infringements on the rights of intellectual and industrial property and no defects or incumplimentos on contractual commitments made by third parties. All website contents, unless otherwise indicated, are the exclusive property of the owning company and , by way of example , but not limited to , graphic design , font, logos , text , illustrations, photographs , code and other elements that appear on the web , which are identified as owned by the owner of the web with the corresponding copyright . Any liability for the use and Contents of the web shall be excluded in cases where causes of force majeure or cases in which the configuration of the User’s equipment is not adequate for the proper use of Internet services provided by the owner of the website in any case , the possible liability of the owner of the web towards the user for all items will be limited to a maximum amount of sums directly from the user by the owner of the website , excluding all case of liability for consequential damages or lost profits. These contents used were created or collected from legitimate sources and dissemination for inclusion on this website. The company owns . uses reasonable efforts to ensure the accuracy, correctness and reliability of the Content effort, but we make no representations or warranties as to the accuracy, correctness or reliability of such Content. Yes because tracking technology content , was included inadvertently in this web any third sign , without proper authorization , the company owning the web will consider any claims that may arise , proceeding to the removal of content or image . Regarding Contents of third parties, the owner of the website states that did not previously control, approve nor endorse the content, services, reviews , communications data, files, products and any kind of information from third parties , natural or legal persons , collected in the Portal. Similarly, does not guarantee the legality, reliability , usability, reliability , accuracy, completeness or timeliness of the content, information and services from third parties on the Website . Similarly not previously controlled and the absence of viruses or other elements in the content and services provided by third parties through campingrutadelaplata.com that may introduce alterations in the computer system, electronic documents or user files is not guaranteed. The company that owns the website does not grant any license or authorization for personal use by the User of its intellectual and industrial property rights or any other right related to the Website and the services offered therein . Therefore, the User acknowledges that the reproduction, distribution, commercialization or transformation of the elements in the preceding paragraphs constitutes an infringement of intellectual property rights and / or industrial property of the owner of the website or the holder of the same . The company that owns the website assumes no responsibility for information that is outside of the Web since the role of links and other mechanisms that link to external information is solely to inform Users about the existence of other sources or content related information and expressly disclaims all liability for the correct operation of such links, the results obtained through such links and for the veracity and lawfulness of the contents or information that can be accessed as well as the damages may suffer by virtue of information found on the linked website . Without prejudice to the provisions stated in each of the forms on the website , when Users give their personal details on any of the forms on the website or through the actions and transactions with the company owner , you are authorizing specifically to the company owning the web site for the receipt, collection, storage , custody and use of data , in order to better serve you . It also acknowledges that is aware that by filling in forms or perform these actions and operations, agree to receive information , advertising and sales promotion of products and services on the website www.campingrutadelaplata.com or third parties and especially any of the websites managed by the company that owns this site. This data provided by the User will be stored in a file owned the company owning the web site that will be duly notified to the Data Protection Agency . Privacy In the process of registration or subscription and in general when requested or provide a key or password to access you are solely responsible for maintaining the confidentiality of your account and your password and for all actions that can be performed on your account and / or your password . Responsible to report immediately to the company owning the web site any unauthorized use of your account and / or your password , as well as for logging in each session. The company that owns the web site will not be held responsible for any loss or problems caused by the loss or breach of duty . Camping Ruta de la Plata assign the user name selected by the user provided that has not been previously selected by another user. Using the password is not transferable , not the assignment , even temporarily , to third parties to be permitted . As such, the user must take the necessary measures for the custody of the password selected by him , avoiding the use of the third party. Consequently, the user is solely responsible for the use of your password is made, with full indemnity for Camping Ruta de la Plata. In the event that the User knows or suspects the use of your password by any third party should bring this to the attention of the Camping Ruta de la Plata at the earliest . The register shall be in the manner indicated in the service or in the Special Conditions , if any , regulate it . 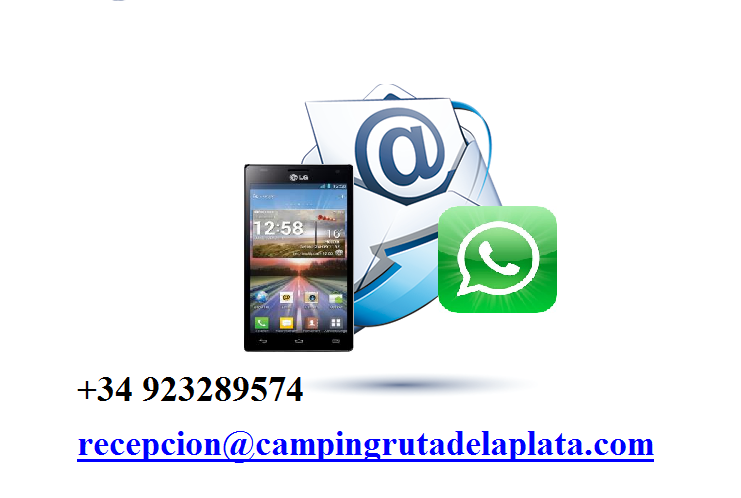 All information provided by the User to the Camping Ruta de la Plata must be truthful. For these purposes, the User guarantees the authenticity of all data communicated as a result of completing the forms necessary for the subscription of the Services. The subscription service Camping Ruta de la Plata assumed by the user subscription to the newsletter and digital push where news and most relevant news of the Website and the world of architecture , interior design , construction and renovations are included . In this respect, the User agrees and accepts the receipt thereof. This consent may be revoked at any time by the user by way of the Ruta de la Plata Camping available to all users for this purpose. You acknowledge and agree that any contractual or non-contractual relationship , if any , executed with advertisers or third parties contacted through campingrutadelaplata.com , and participation in promotional activities , sale of goods or services is deemed to take place only and exclusively between you and the advertiser and / or third person. Accordingly, you agree that the owner of the website does not have any responsibility for damages of any kind arising from the negotiations and contacts, contracts and other relationships with advertisers or third natural or legal persons contacted campingrutadelaplata.com through . In any litigation or attaching to the web site and by extension the company owner will apply Spanish law, be competent for the resolution of all disputes arising from or related to the use of this website the Courts of Salamanca city ​​( Spain ) . If any of the parties involved , the user or designated staff ceases to reside in Spain , litigation or any dispute arising from the interpretation or implementation and execution of this document may be resolved under the rules of the relevant Spanish jurisdiction. Copyright © 2019 Camping Ruta de la Plata Salamanca . All Rights Reserved.